Manganese is an essential trace element for all plants. Manganese acts as an activator for different enzyme reactions in the plant, for example in water-splitting during photosynthesis, the synthesis of amino acids and proteins and the build up of plant cell membranes and chloroplasts. Manganese is generally taken up via the roots. Once inside the plant it is difficult to transport but not as difficult as calcium or iron for example. Silicon and molybdenum improve the transport possibilities for manganese in the plant. Check the medium’s pH when the first symptoms are noticed. High pH values mean that there is less manganese available for the plant. By lowering the pH of the nutrition (pH minus (down)) the medium’s pH can be lowered to 5.0 - 5.5. Low substrate temperature can be the cause of reduced manganese absorption. If a deficiency is noticed, check that the substrate temperature is sufficiently high (68 - 77 oC) during the day. Using products that contain trace elements may also help. A manganese deficiency is usually not a problem on its own. To facilitate manganese transportation in the plant, molybdenum is needed. Thus, the problem may well be a molybdenum deficiency. High levels of phosphorus may also result in a reduced availability of trace elements like zinc, copper and (of course) manganese. CANNA advises to use a mix of all needed trace elements. 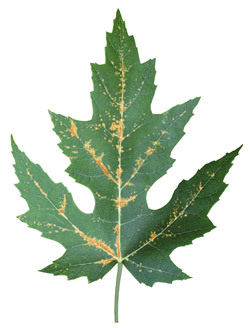 Trace elements can be given to the plant both in the feeding and by spraying the leaves. Spray the plant at the end of the day and spray daily with water after spraying to prevent burning.